Tom Clancy's royalty check will expand by an undisclosed sum next year, as Ubisoft has reconnoitered the first quarter of 2010, announcing that Ghost Recon 4 will likely arrive before March 31st. Ubisoft's quarterly report didn't shine any light on further Ghost Recon 4 details, sadly, merely ruling out a release this calendar year. 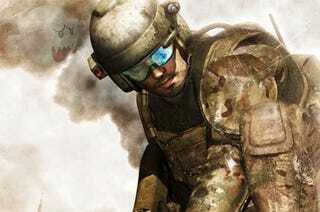 The most recent entry in the series, Tom Clancy's Ghost Recon Advanced Warfighter 2, was released in March of 2007 and gives us strong reason to believe that the currently announced title of Ghost Recon 4 is merely placeholder—not even close to the number of required syllables. Fans of the scribe's work being attached to video games will have to settle for Tom Clancy's Splinter Cell: Conviction, which hits later this year.